Tourism and ecotourism are the major contributors to the local economy, with the polar bear season being the largest. The cold waters of Hudson Bay bring polar bears into the area in October and November, while the mouth of Churchill River brings thousands of five-metre-long, pure white Belgua whales in June and July. Summer also brings birdwatchers to the treeless tundra region. In winter people from all over the world brave the bitter cold to view the spectacular aurora borealis, also known as the northern lights. Living with polar bears isn’t easy. They’re fierce predators, double the size of the largest lions or tigers, and always hungry when on land where they find little food. Seals are their main food source but the bears can only catch them when the bay is frozen. Fifty years ago any bear near Churchill would be shot on sight. Their numbers fell dramatically and conservation measures were put in place. Although there are no roads to Churchill, it is less than three hours by plane from Winnipeg, Manitoba’s international airport, making it relatively easy to see polar bears in the wild. 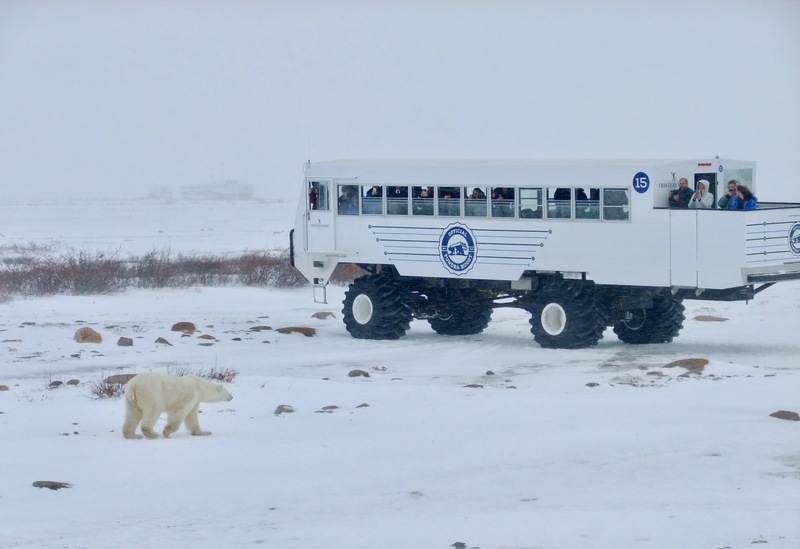 In the late 1970s a tourism operator built Tundra Buggies, school-bus-sized, four-wheel-drive vehicles with two-metre high wheels to navigate the roadless tundra while safely allowing tourists to see polar bears in their natural habitat. “We don’t call our business ecotourism,” says John Gunter, President and CEO of Frontiers North Adventures, the main tourism operator in Churchill with 14 Tundra Buggies. “I’m not sure what ecotourism really means in practice,” Gunter told IPS. However Frontiers North is committed to sustainable tourism and has followed the Canadian Business for Social Responsibility guidelines for ten years. They issued their first sustainability report in 2016 based on the Global Reporting Initiative. The company plans to release a new sustainability report in 2019. “It takes time to do this kind of reporting and some things are really hard to measure,” Gunter said. While some of Frontier’s customers are keen to know about the company’s practices, the report is mainly for employees and the local community he said. Much of the area around Churchill is under protection as a national park and Frontiers has limited the companies’ growth to minimise impacts. Polar bears need sea ice to survive, however global warming has dramatically reduced the amount of sea ice in the Arctic. To reduce its carbon footprint, the company makes sure flights in and out of Churchill and their Tundra Buggies are as full as possible. The company launched a recycling program that the local authorities now run and eliminated use of plastic water bottles. Frontiers North buys from local suppliers and employs as many Canadian and local-to-the-north guides as possible. They also support Churchill’s Junior Canadian Ranger Program that offers young people in isolated communities opportunities to build their outdoor and traditional skills. “Our guests come for the polar bears but they end up learning about our community, the indigenous culture, environmental issues affecting the region,” he said. “Frontiers are a tremendous partner in our conservation and education efforts,” said Kt Miller, of Polar Bears International (PBI), a world-renowned non-profit organization dedicated solely to the conservation and protection of wild polar bears, and the sea ice they depend on. The company has provided the permanent use of a Tundra Buggy for PBI’s research and education programs. Those programs include webchats with polar bear scientists from the buggy and live web cameras of polar bears that anyone with an internet connection can access. “We want to share the experience of seeing a polar bear in their natural setting with everyone,” Miller said. In summer PBI is involved in research on belgua whales and there is an underwater web camera on their boat which is very popular. Bear safety is an important part of Churchill culture says David Allcorn, an expedition leader who has worked throughout the Arctic. The bears often wander near or into town looking for food but instead of shooting them, residents call a 24-hour “Bear Alert” hotline. Conservation officials respond to drive the bears away. If they persist, they are live-trapped and put in the a holding facility known locally as ‘Polar Bear Jail’. When Hudson Bay is frozen, the bears are released. No one is allowed to feed the bears, and any garbage is either locked up or collected quickly. We can’t let bears associate humans with food explained Allcorn. When a tourist tossed a sandwich out of Tundra Buggy to lure a bear closer for a better photograph, he and everyone else on the tour were immediately taken back to town, he recalled. The man was then put on the first plane out of Churchill. The first global Sustainable Blue Economy Conference is currently taking place in Nairobi, Kenya from Nov. 26 to 28 and is being co-hosted with Canada and Japan. Over 13,000 participants from around the world have gathered to learn how to build a blue economy.